Here are the news you shouldn't miss today. -- Vietnam's National Assembly is willing to work with its counterpart in South Korea to further enhance the sound friendship and sustainable cooperation between the two parliaments, chairwoman of the Vietnamese legislature Nguyen Thi Kim Ngan affirmed during talks with her South Korean counterpart Moon Hee-sang in Seoul on Thursday. -- Vietnam’s Ministry of Defense treasures and spares no efforts to develop sound traditional relations with the Cambodian army and people, Deputy Minister of Defence Le Chiem said as he hosted General Mam Sophat, director of the Department of Legal Affairs under the Cambodian Ministry of Defence in Hanoi on Thursday. -- Vietnam’s Ministry of Public Security and Singapore’s Ministry of Home Affairs signed a document on extending the agreement on bilateral cooperation in the field of cross-border crime prevention and control, after Vietnamese Minister of Public Security To Lam held talks with Singaporean Minister for Home Affairs and Minister for Law K.Shanmugam in Hanoi on Thursday. 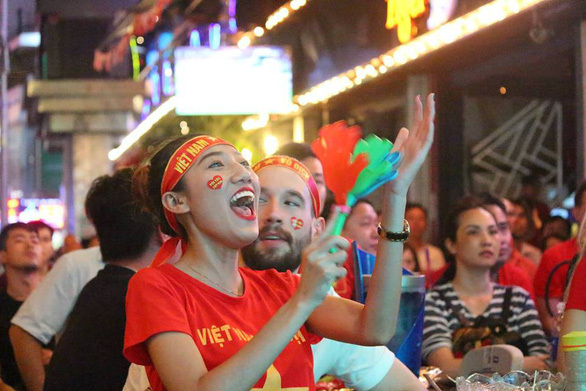 -- A group of football fans celebrating Vietnam's 2-1 victory over the Philippines at the 2018 AFF Championship in Hanoi on Thursday night have been taken to a police station after they fired two flares near the capita's Hoan Kiem Lake. -- Three college students in the central city of Da Nang have been arrested and detained on charges of appropriating property, as they are suspected of swindling 300 victims of more than VND2 billion ($86,000) by promising to sell them luxury scooters at cheap prices via online websites, only to steal their upfront payments. -- Nguyen Thi Phuong Thao, president and CEO of budget Vietnamese carrier Vietjet, is ranked 44th in the World’s 100 Most Powerful Women list announced Thursday by Forbes. Thao jumped 11 spots from last year’s ranking. -- Vietnam and Cambodia are capable of making their bilateral trade value at US$7-8 billion by 2020, thanks to their sound cooperation established across sectors, Vietnamese Prime Minister Nguyen Xuan Phuc said as he and his Cambodia counterpart Hun Sen attended the Vietnam-Cambodia Business Forum in Hanoi on Thursday. -- Vietnam's rates for 5 percent broken rice dipped to US$400 a metric ton from $408 last week as exports to China fell on stricter inspections and conditions on Vietnamese rice, Reuters reported on Thursday, citing traders. -- Five trade deals worth nearly $2 billion were signed between Vietnamese firms and international partners during the Vietnam Tourism Forum 2018 in Hanoi on Thursday. -- Vietnam's E5 bio-petrol price has dropped by 1,446 VND per liter, while RON95 fell 1,513 VND per liter starting 3:00 pm on Thursday. -- Vietnamese tour organizers reported that their packages to Malaysia have been sold out right after, and even before, Vietnam beat the Philippines in Hanoi on Thursday night to advance to the finals of the 2018 AFF Championship, with the first-leg game scheduled for November 11 in Kuala Lumpur.